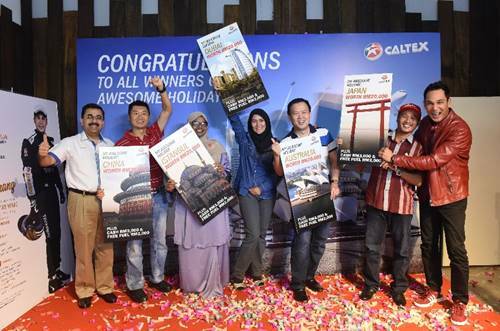 Lucky Caltex Customers Fly Away with Awesome Holiday Packages worth RM 125,000! Chevron Malaysia Limited, which markets the brand Caltex®, recently concluded its “Awesome Holiday Package” campaign in conjunction with the final episode of its sponsored reality TV show, Celebrity Car Wars Season 3. The show saw popular Malaysian celebrity Dato’ Hans Isaac driving home as the champion, who was recently announced as Chevron’s partner. Maintaining the positive relationship with its customers, Chevron also announced its latest exciting initiative – the “Spend & Sweep” promo campaign, in partnership with local hypermarket chain MYDIN. From now until 15th March 2019, Caltex customers stand a chance to be one of the lucky 35 customers to win a shopping spree at MYDIN worth RM 3,000.